If you have wondered if native advertising fits within your promotional content mix, here is a great case study on Beech-Nut baby food products. Beech-Nut Nutrition Company is a leading food manufacturer in the U.S. known for its innovative approach to baby food. Baby food brands have seen sales decline since 2005 because of lower birth rates; however, there is another trend troubling brands. More millennial moms are taking an active role in preparing homemade baby food for their little one. Moms spend on average three hours out of their week or an hour out of their day to make their own baby food. In April, Beech-Nut changed its approach on how it made baby food that is winning over millennial moms, but it needed a new way to reach its target audience. Beech-Nut worked with Someecards to create co-branded cards that discussed the tough realities of being a new mom. Someecards parodies the sentiments found in the Hallmark greeting card by using humor that is sometimes considered sarcastic or borderline offensive. The co-branded e-cards highlight the joys of motherhood with cards that read, “The only chance I got to sit down today was on the toilet,” or “I want my baby’s food to be as natural as I tell everyone my childbirth was.” The campaign comprised of five e-cards that are hosted on Someecards’ site earlier this month. So far, the e-cards have more than 15,000 shares on the site and amplified through its social channels. Beech-Nut relies on its small, but mighty mom ambassadors to share its content across social media channels. While Beech-Nut has a strong community on its Facebook, Twitter, and Instagram channels, it needed to amplify its message and reach new moms looking for ‘real’ baby food. 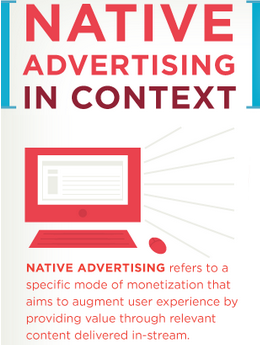 Native advertising sees higher engagement than banner ads, 52 percent of people who click on native ads have purchase intent compared to 34 percent for banner ads. Most competitors in this space have relied on traditional media to reach moms. In order to cut through the noise, Beech-Nut decided to take a different approach to reach moms with humorous native advertising. Someecards goes for humor and raw honesty, which help build its audience of roughly 10 million unique visitors a month, according to comScore. While it may seem peculiar for a baby food provider to partner with Someecards, reviewing past social posts shows the brand uses humor often to connect with its moms. For Beech-Nut, sharing a bit of humor helps create community with its audience that will share its content with other friends. In addition to this campaign, Beech-Nut also works actively to cultivate community through its mommy blogger outreach program and free samples. Beech-Nut has used Someecards as the primary platform for this campaign distribution with its Facebook page as a secondary channel. The brand’s current Facebook page is relatively active with social shares, daily posts, and has more than 380,000 likes. The Beech-Nut native advertising campaign was consistent with the brand’s honest and transparent brand values. While humor is not actively used in Beech-Nut’s advertising, it is often used on its social media channels. As one marketing expert wrote, “Make people laugh and they will not only share an ad with their friends and family, but with humor the second best emotion at driving brand recall, they will most likely remember the brand for years to come.” Overall, the campaign was funny and consistently used the company’s visual identity so moms who saw it would remember Beech-Nut. Coupling humorous native ads with social media amplification was a large investment for Beech-Nut; however, the success of the campaign will continue to grow. Weber Shandwick reported last year that millennial moms spend 17 hours each week on social networks and are better sharers of information and recommendations for areas such as food, baby products, and retail. Working with Someecards provided Beech-Nut with a wider distribution network that is much larger than its current owned channels and the opportunity to reach new moms in the market for baby food. Overall, The co-branded cards were well received within its community. Beech-Nut has not only innovated its baby food products, but also found a new way to connect with millennial moms that cuts through the noise and provides a laugh.